This is not my first rodeo. This blog has actually changed sites two or three times before finding its permanent home here, and if I know anything about my personal blogging style it is that it's sporadic. I am just not that great at posting everyday with consistent topics. Hey, at least I know that. Now I will try and fix it! 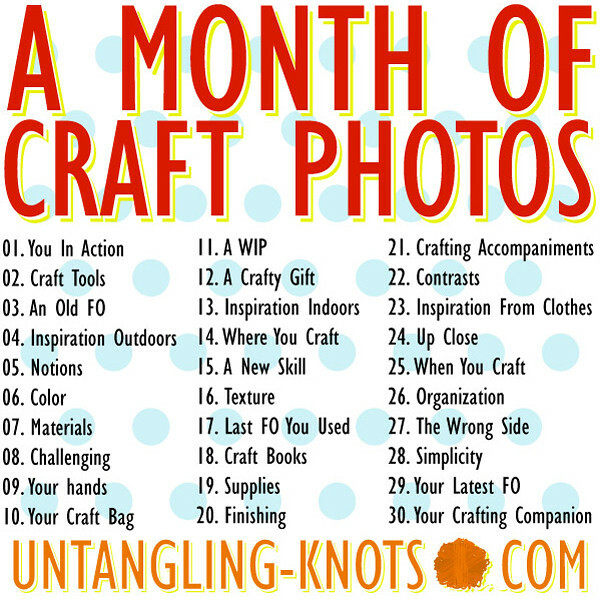 The other day I stumbled upon A Month of Craft Photos, a neat little photography project that will share a bit of myself and my knitting with you. I think having some prompts on what to post will be a wonderful thing for me. Now, I am not a crazy person and I know myself a little too well to actually believe that I will be able to do this every single day consistently, so honestly I'm not going to try. But I assure you, one day this list will be complete in full, in order. It may just become "A Month (or two or three) of Craft Photos"
So here I am, Day One, Me in Action.